With a stay at DoubleTree by Hilton Hotel Denver in Denver (Park Hill), you'll be convenient to Johnson and Wales University and Northfield Stapleton. This hotel is within close proximity of Denver Museum of Nature and Science and Denver Zoo. Make yourself at home in one of the 561 air-conditioned rooms featuring flat-screen televisions. Complimentary wired and wireless Internet access keeps you connected, and digital programming provides entertainment. Private bathrooms with bathtubs or showers feature designer toiletries and hair dryers. Conveniences include phones, as well as desks and complimentary weekday newspapers. Take advantage of recreational opportunities offered, including an indoor pool, a spa tub, and a sauna. Additional amenities at this hotel include complimentary wireless Internet access, ski storage, and gift shops/newsstands. Guests can get to nearby shops on the complimentary shuttle. Enjoy a meal at a restaurant or in a coffee shop/café. Or stay in and take advantage of the hotel's room service (during limited hours). Relax with a refreshing drink at one of the 2 bars/lounges. Featured amenities include a business center, express check-out, and complimentary newspapers in the lobby. Event facilities at this hotel consist of conference space and a meeting room. A train station pick-up service is provided at no charge, and free self parking is available onsite. 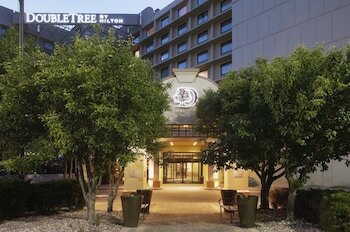 DoubleTree By Hilton Hotel Denver is the best Denver lodging choice for your trip to Colorado. With numerous amenities for guests such as 24 hour front desk, fitness center, gift shop, you will wake up at DoubleTree By Hilton Hotel Denver feeling refreshed every day for your time in Denver. Don’t let this amazing reservation opportunity pass you by, book your stay at DoubleTree By Hilton Hotel Denver today to make the most of your time in Denver, Colorado.